Do it Like the Pros with Channel LettersIf you've ever driven past a strip mall at night, then you're probably familiar with the effectiveness of channel letter signs. 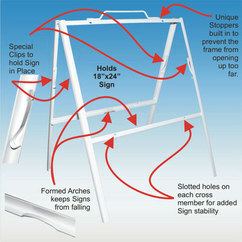 One of the most common ways to sign your business, our channel letter signs can be created to fit any budget and idea. Shape your image inside and out. Make an impression with custom dimensional letters. Identify your location and capture more attention by placing your business name or logo prominently on the outside or inside of your building. When used outside, dimensional letters withstand all types of weather and stand the test of time. That's it.Magnetic signs for your vehicle provide a simple, fast and economic way to advertise your business or product. Indoor Signs Speaks Volume About Your Business!Indoor signs can speak volumes to your clients before they even make contact with you. CUSTOM SIGNS / PARKING, STREET, PROPERTIES SIGNS. STEEL A-FRAME 18" X 24"